The Large Hadron Collider has settled into a steady period of running and is now delivering about one inverse femtobarn each week (actually it was about 0.98/fb in the last seven days including a single fill of over 200/pb yesterday.) There are 17 days until the cut-off for ICHEP (contribution list now filling out) , the biggest international particle physics conference of the HEP calendar that is being held in Melbourne from 4th July. If there are no snags they should still be able to reach the target of 5/fb delivered and the experiments will show new Higgs results with at least 4/fb at 8 TeV. That is about as potent as last years 5/fb at 7 TeV. If they get similar bumps at the same places as last year that should settle the existence of the Higgs at least unofficially, but unlucky statistical fluctuations could still leave the result hanging. Official discovery will probably have to wait a little longer. I think they will hold back from combining the new data with last years until both experiments can claim discovery. ATLAS and CMS have shown very similar sensitivity and resolution especially in the crucial diphoton channel despite completely different detector technologies. It would not be fair if one of them got the discovery first due to lucky statistics. They can conveniently time their combinations to avoid that hapening. According to Paul Collier (commenting at LHCportal) they still have some scope to slowly increase the bunch intensity up to 160 billion protons per bunch for another 20% increase in luminosity. That is the limit for this year and realistically I think that 1/fb per week will be about the average amount delivered over the remaining 17 week of proton physics minus any time for recovery from technical stops, extra MD or special runs for TOTEM. They should comfortably reach their target of 15/fb total delivered to each of ATLAS and CMS. 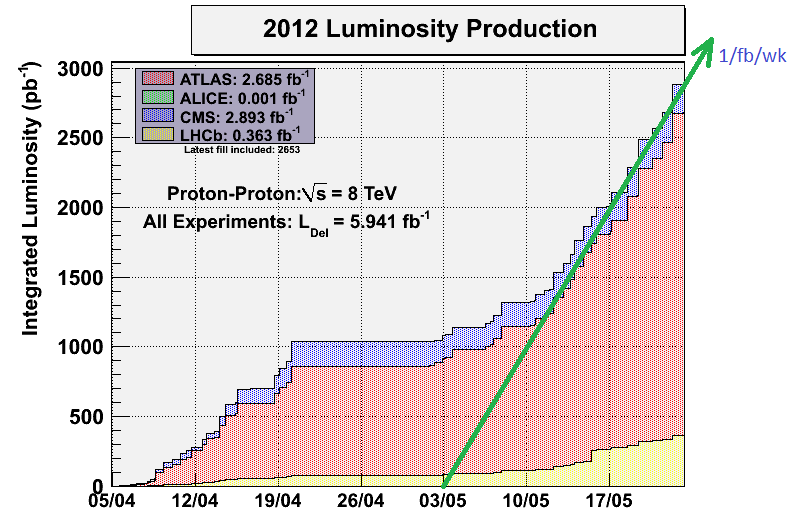 Full Higgs combinations of ATLAS+CMS have not been seen since autumn last year when they had just 2/fb. Although they have not given any explanation for this there are several factors that come into play. The sheer complexity and quantity of all the data means that the big combinations require enormous amounts of computer resources (when done exactly). By time they could complete the calculation the experiments have usually added something new making the answer obsolete before it is ready. I imagine they can’t afford to waste their computer resources or manpower in that way with so many other things to be done. Another problem is that the two experiments have seen maximum peaks at slightly different Higgs masses. The favorite theory for this is that the energy calibration has worked out slightly differently through systematic errors in the two experiments. The consequence is that the combination only gives a small improvement in significance over the individual results. But I think the most important reason for not doing the full combination now is that they can reach discovery level this year with both experiments separately. It will make a more spectacular and convincing presentation of the discovery if they can do it that way rather than with a cross-experiment combination. I could be wrong but I think there is a good chance that they will do full combinations of ATLAS+CMS only during the long shutdown as part of a more detailed analysis to compare observations with the standard model predictions. Until then people will have to be content with unofficial approximate versions. While you are waiting for ICHEP do not miss the meeting at Blois. The first session has some particularly interesting talks not least of which is a presentation by Nima Arkani-Hamed on why he thinks a 125 GeV Higgs smells like SUSY. It’s a 30 minute talk but there is already a YouTube version online where he crams it into 1 hour 42 minutes and still skips slides at the end. You are recommended to set aside the time to watch it. Update 25-May-2012: They have now passed the milestone of delivering 1/fb in one week to ATLAS and CMS. Here is a table of the fills that did it with the latest still running. I have been showing unofficial Higgs combinations here for the last year or so but maybe you want to try some unusual combinations of your own. 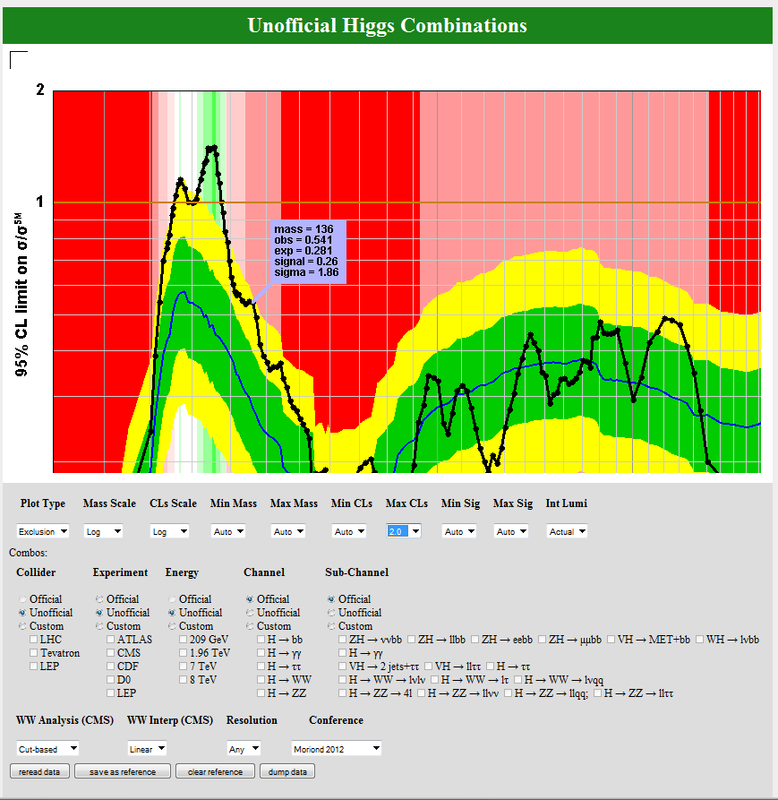 Now you can using the viXra unofficial Higgs combination Java applet. It is armed with most of the plots published by the experiments CDF, D0, CMS, ATLAS and LEP. You just have to choose how to combine them. I am hoping it is self-explanatory but ask some questions and you may get some good tips. You may need to update your Java plug-in. Disclaimer: The results are approximate, unofficial and not endorsed by the experiments. There is a Nobel Prize for the Higgs Boson, but who will get it? With the discovery of the “Massive Scalar Boson” (a.k.a The Higgs) now seeming imminent, physicists are jostling for position to take the credit. There are at least seven living physicists who played key roles in the prediction of its existence fifty years ago and many more experimentalists and phenomenologists who worked more recently on its likely discovery at the LHC with supporting evidence from the Tevatron. It seems that at least one Nobel must be up for grabs for the theoretical work in the 1960s and possibly another for the experimental side, but the rules only allow for three laureates to share a prize, so who will the Nobel committee choose? It is not just the prize money that is at stake. There is fervent national pride to play for. The prize for the Higgs boson is building to become the most widely anticipated Nobel Prize in history. Already we are seeing campaigns to support the various candidates in the form of people naming the particle in honour of their colleagues as a way of supporting their cause. Controversy started mounting at the Higgs Hunting conference in 2010 in Paris. The organisers decided that the sought after boson should actually be called the Brout-Englert-Higgs boson to recognise the contributions of 1964 Robert Brout and Francois Englert who submitted the first complete paper on the symmetry breaking mechanism a few weeks before Higgs. This ignited a raging controversy set alight by supporters of Tom Kibble, Gerald Guralnik and Carl Hagen, three physicists who submitted an independent account of the mechanism just as the work of the other three was appearing in print. Later in 2010 the Sakurai Prize was awarded to all six making the Anglo-French campaign to support only three seem especially chilling. In 2011 Robert Brout died. The Nobel cannot be awarded posthumously. If Brout, Englert and Higgs has been the leading contenders to take the prize before then Brout’s death opens up the way for a third Laureate to be recognised, who if anyone will it be? One possibility would be to include Kibble as a representative of the third group and also because of his extra work on the non-Abelian version of the mechanism that proved important when Weinberg and Salam developed the full theory by applying the symmetry breaking theory to Glashow’s Electroweak Gauge theory. Another strong contender is Philip Anderson who took an influential step towards the discovery with a non-relativistic model inspired by condensed matter theories. Other possibilities might be Goldstone whose theoretical work on symmetry breaking that paved the way for the discovery has been overlooked by the Nobel committee. Perhaps even a phenomenologist such as John Ellis who did so much to develop the theory leading to its discovery could be honoured. Getting to the bottom of it all is not easy. The final form of the Higgs mechanism was put in place by Steven Weinberg and independently Abdus Salam as the standard model Electro-Weak unification, but that work has already been rewarded, so the question is about which precursors are worthy of an extra Nobel for the Higgs. Was the prediction of the particle itself the essential element or was it the mechanism what counts? Only Higgs himself emphasised the importance of the massive Higgs boson in his early work. Does it matter if the first account was non-relativistic or was a full model for the boson required? Will they take into account that a potential winner already has one Nobel Prize? These are questions that only the Nobel committee can answer. One thing for sure is that the controversy can only get stronger. At a recent conference in La Thuille Englert was invited to open the session about the Higgs Boson’s near discovery with a talk about its theory. This time it was the American Tevatron teams who used the BEH label while ATLAS and CMS opted for the “SM Scalar Boson”. For the record let me state my opinion for what its worth. If I were able to nominate for the Nobel prize for the theory my choice would be Higgs, Englert and Goldstone. Higgs deserves it for highlighting the experimental prediction of the massive scalar boson while Englert in collaboration with Brout was the first to publish a description of the symmetry breaking mechanism. Goldstone is added for realising the importance of the Mexican hat potential and its consequences as well as the understanding he provided for the strong force. The work of Anderson was important but it was too incomplete and he is already a Laureate. Kibble, Guralnik and Hagen offered important explanatory details for how the mechanism overcomes the Goldstone theorem but their contribution was too late to be considered part of the original discovery. However, if Goldstone were replaced by either Anderson or Kibble in the list it would still look very reasonable. 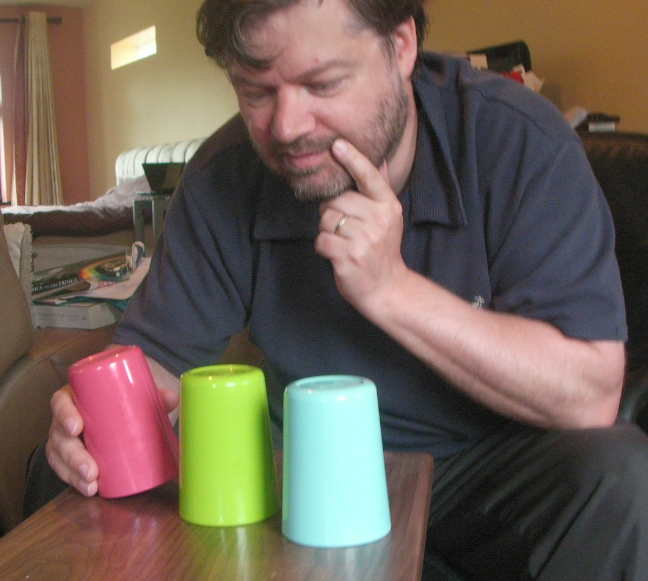 The prize committee may set their own criteria or just be influenced by how many nominations each physicist gets. If choosing the winners of the theory prize is hard enough, the allocation of the prize for its experimental discovery is even harder. No small set of individuals among the thousands who have worked in collaboration can take enough of the credit to single them out. In a few past cases the Nobel committee has given the award to the head of the lab concerned, but the Tevatron and LHC have been developed and run over many years and the directors have changed several times. My guess is that no Nobel will be given for its experimental discovery, just as none has been given for finding the top quark. W. Heisenberg, Z. Phys. 49 (1928) 619. In an early precursor to the Higgs mechanism, Ernst Stueckelberg proposed a model of massive quantum electrodynamics with a coupled scalar field to spontaneously break the symmetry. This was different from the Abelian version of the Higgs mechanism in that it used an affine representation of the group rather than a linear one. Like much of his work this was ahead of its time and did not receive much credit during Stueckelberg’s lifetime. Ginzburg and Landau used a macroscopic thermodynamic theory to show how spontaneous symmetry breaking can make the photon massive and explain superconductivity. The symmetry breaking is induced by an electrically charged Bose condensate. This made use of an idea introduced by Landau where a W shaped potential spontaneously breaks the symmetry. It can be regarded as a thermodynamical precursor to the idea of the Mexican hat shaped Higgs potential that breaks the gauge symmetry in the standard model. Yang, C. N.; Mills, R. (1954). “Conservation of Isotopic Spin and Isotopic Gauge Invariance”. Physical Review 96 (1): 191–195. Based on unpublished ideas of Wolfgang Pauli, Chen Ning Yang and Robert Mills developed a generalisation of the abelian gauge theories of quantum electrodynamics to non-abelian gauge groups. The theory was initially regarded as a failure due to its prediction of massless gauge bosons whereas the relevant nuclear interactions required massive intermediaries to explain the short range nature of their force. Despite its eventual spectacular success in the Standard Model, no Nobel was ever awarded for Yang-Mills theory although Pauli and Yang were physics laureates for other work. This research described the first microscopic model that realised the theory of Ginsburg-Landau to explain low temperature superconductivity. Electrons form Cooper pairs which act like bosons and produce the charged Bose condensate as described by Ginzburg and Landau. The model breaks the electrodynamic gauge symmetry giving the photon an effective mass. This later became the inspiration for the Higgs mechanism where the bosonic field is fundamental. The three physicists were awarded the physics Nobel Prize in 1972 for this work. Y. Nambu, Axial vector current conservation in weak interactions, Phys. Rev. Lett. 4 (1960) 380. Nambu investigated the effects of symmetry breaking in the context of superconductivity and found that it led to a massless particle. He then considered the idea that a similar mechanism may be relevant to particle physics where the pion is nearly massless. This is due to spontaneous breaking of approximate chiral symmetry leading to a light pseudo-Nambu-Golsytone boson. Following Nambu, Jeffrey Goldstone showed that there would be massless particles when a continuous symmetry is broken. These particles are now called Nambu-Goldstone bosons. This was regarded as a problem for any attempt to use spontaneous symmetry breaking where no massless particles are known. This discovery was important in the theory of the string interactions where the pion can be regarded as a pseudo-Nambu-Goldstone boson. Goldstone also used elementary scalar fields with mexican hat potentials that became a crucial element of the Higgs mechanism. Nambu won a Nobel Prize for spontaneous symmetry breaking in sub-atomic physics but Goldstone has never been awarded the prize. Y. Nambu and G. Jona-Lasinio described a four fermion model in which chiral symmetry is spontaneously broken and a zero mass boson is generated. Gauge unification of electromagnetic with weak force, but no Higgs mechanism or other form of symmetry breaking so gauge bosons would be massless contrary to known physics. A proof was given that a zero mass boson appears when symmetry is spontaneously broken. This was a disappointment because such a zero mass particle should be easily observable so it seemed to rule out the use of symmetry breaking. The development of the Higgs mechanism came about as a realisation that the conditions of the theorem did not apply to gauge theories. Julian Schwinger studied a model of quantum electrodynamics in 2 dimensions with a Dirac fermion. The Schwinger model can be solved analytically. It is found to exhibit spontaneous symmetry breaking of the U(1) symmetry making the photon massive. There are different views on how well this is related to the Higgs mechanism but it was certainly an influence in guiding people towards the idea that symmetry breaking could provide massive gauge bosons. Motivated by his work in condensed matter physics, Philip Anderson showed that spontaneous symmetry breaking of gauge symmetry can give mass to the gauge bosons. His mechanism was essentially a nonrelativistic precursor to the Higgs Mechanism . The work was published in Physics Review rather than a condensed matter journal because Anderson thought it relevant to particle physics. The crucial observation was that the troublesome massless Goldstone boson mode is absorbed into the gauge boson field transforming it from the component field of a massless particle to the three component field of a massive one. He did not point out that a massive scalar boson would also be important. Anderson was overlooked when the 2010 Sakurai prize was given to Higgs, Brout, Englert, Kibble, Guralnik and Hagen for the Higgs mechanism. Some people justify this by pointing out that the relativistic extension of his idea is non-trivial and an important part of the theory. Others say that there is bias against him from particle physicists because he is condensed-matter physicist and argued against funding the American SSC hadron collider. It is a difficult call, he certainly had some of the key elements, but the Nobel Prize is usually only given for more complete theories. In the form presented by Anderson the idea was described by Higgs as crucial but just speculation. At least Higgs cited Anderson’s paper. Brout, Englert, Guralnik, Hagen and Kibble all left the reference out despite being well aware of the prior work. Abraham Klein and Ben Lee pointed out that the relativistic case of Anderson’s idea would be harder because Lorentz invariance and the lack of a referred reference frame restricted the terms that could be used. They thought that it might still be possible. W. Gilbert, Broken symmetries and massless particles, Phys. Rev. Lett. 12 (1964) 713. In response to Klein and Lee, Walter Gilbert showed that under certain assumptions it was not possible to extend Andersons idea to the relativistic case. This perhaps demonstrates best of all that the subsequent steps were not a trivial development of Anderson’s non-relativistic version of the theory. Gilbert later switched to biology and was awarded a Nobel Prize in chemistry. He was also a thesis advisor to Guralnik. P. Higgs (1964). “Broken Symmetries, Massless Particles and Gauge Fields”. Physics Letters 12 (2): 132. When Higgs saw Gilbert’s paper it soon occurred to him that Schwinger’s model already provided a counterexample to the claim that a relativistic theory of symmetry breaking without massless bosons was not possible. He quickly wrote a note for Physics Letters that was submitted on 24th July and was later accepted. A second paper describing the model in detail was submitted a week later. This contained a complete model of the Higgs mechanism for abelian gauge theories. It was a hybrid of Goldstones scalar theory with Maxwell’s equations. This second paper was rejected. It has been said that the referee who rejected the paper was Nambu and that he suggested the paper needed to have more about the experimental implications of the model. It has even been said that he highlighted the massive scalar boson in the spectrum. Higgs does not mention this influence in his account and says that he revised the paper himself along such lines. It was sent to Physical Review Letters at the end of August and was accepted. Higgs says that Nambu was the referee of this second paper for PRL not PL and that he drew his attention to the work of Brout and Englert which had just been published, with the result that Higgs added a citation to their paper. G.S. Guralnik, C.R. Hagen and T.W.B. Kibble (1964). “Global Conservation Laws and Massless Particles”. Physical Review Letters 13 (20): 585. The GHK paper on the symmetry breaking mechanism came later than BEH so it would have to add some crucial piece of the picture to be regarded as prize worthy. It is often regarded as the most comprehensive treatment of the time and showed how the massless mode is avoided in more explicit terms. It did not recognise the massive scalar boson but it is not obvious that this would have increased its worthiness if it had. The real question is just whether the extra contributions they made entitle the authors to be recognised as original pioneers of the Higgs mechanism. The authors were included in the award of the Sakurai prize in 2010, but there is no room for them to be included in the Nobel Prize. At best they can hope for one of them to be included. A. Migdal and A. Polyakov, ZHETF 51, 135 (1966). In 1966 Polyakov and Migdal working in Russia published another independent verison of the Higgs mechanism. Although the publication was significantly behind the others this is said to be due to the publication originally being rejected by the journal it was submitted to. No date has been given for the origianl submission. Some say it was in 1965 and others say it was in 1964 and even before the work of Englert, Brout and Higgs. Polyakov a young student at the time who later became a formidable physicsts responsible for many other contributions to the subject. Nobody would doubt his ability to develop the theory at that time but the peer-review system and the iron curtain may have robbed him of due credit for the Higgs boson. This work reasoned that a gauge theory using the Higgs Mechanism could be renormalizable. P. W. Higgs, Phys. Rev. 145 (1966) 1156. This was a more detailed paper about the Higgs Mechanism and its experimental consequences. T. W. B. Kibble, Phys. Rev. 155, 1554 (1967). S. Weinberg, Phys. Rev. Lett. 19 (1967) 1264. A. Salam, in the Proceedings of 8th Nobel Symposium, Lerum, Sweden, 19-25 May, 1968, pp 367-377. Abdus Salam independently provided his formulation of the Electroweak theory. G. ’t Hooft, “Renormalizable Lagrangians for massive Yang-Mills fields” Nucl. Phys. B35 (1971) 167. Proof that the standard model is renormalisable. It was not until this paper was published that acceptance of the Electroweak theory became widespread. J. R. Ellis, M. K. Gaillard and D. V. Nanopoulos, Nucl. Phys. B 106 (1976) 292. In this paper the authors started to look at how the Higgs might be observed in accelerators and alerted experimentalists to the possibility. Tomorrow Peter Higgs will give a talk at CERN Bristol about how he discovered the Higgs Boson. It will be webcast live. He has given this talk several times before and there are both printed and video versions of it online, still it will be interesting to hear what he has to say about the latest results from the LHC. I am planning to write something about the intricate and controversial history of the theoretical side of the discovery later on, so stay tuned. Update: A recording of the talk is online. You are currently browsing the viXra log blog archives for May, 2012.